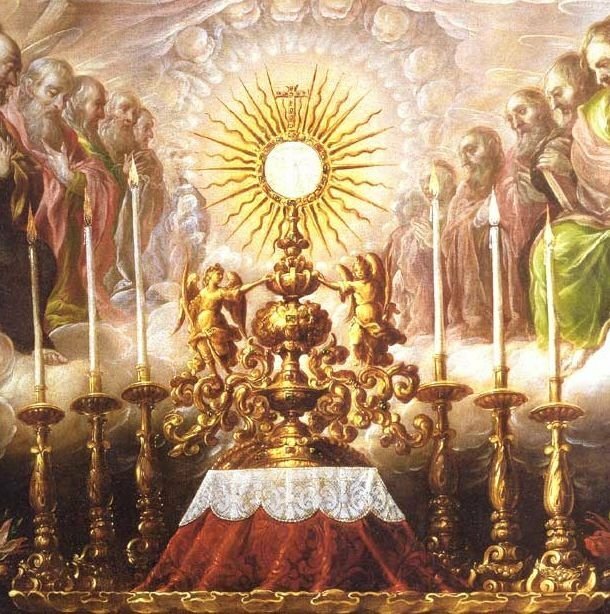 A very happy Feast of Corpus Christi! A reminder that Mass is tonight at 7:30. More music coming to Bedford! Great news! Two extra sung Masses a month, with music performed by Matthew Schellhorn. We are very pleased to announce that we are increasing the number of Sung Masses at Bedford! You might recall that a few weeks ago Matthew Schellhorn kindly sang and played the organ at our 8.30 Mass. The FSSP is pleased to announce that he has accepted the invitation to sing and play on two Sundays a month outside of July and August. Federation Una Voce, during which time he served as Moderator of the Sacred Music Sub-Committee. More recently, between 2017–18 he was Associate Director of Music at St Dominic’s Priory, Haverstock Hill, and continues as Director of Music for the celebrations according to the 1962 Missal at St Anne Line, South Woodford. Since 2015 he has been Director of Music for London of the Latin Mass Society, where in that capacity and with his professional group Cantus Magnus he provides the music for the monthly Masses organised by Juventutem London and for the Sacred Triduum held at St Mary Moorfields, London. His other work includes giving recitals and recording as a pianist, examining for ABRSM, and teaching in Cambridge where is a member of the Faculty of Music. He currently lives in London with his wife, Benna, and their two sons, Ferdinand and Caspar. Matthew’s involvement with us will be to play the organ and sing on the third Sunday of each month plus one additional Sunday. The dates of those additional Sundays will be chosen with an eye to important celebrations such as the feast of Christ the King and the annual November Requiem for war dead. Our schola, led by Katherine Smith, will continue to sing on First Sundays. As we look forward to welcoming Matthew, our thanks goes to Katherine and our schola for their ongoing commitment and hard work. After the week before last, they can now pride themselves in saying that they have sung a Pontifical Mass! Over time Matthew hopes to get to know Christ the King’s parishioners and explore how his musical contribution to the life of our apostolate in Bedford can organically grow and develop. We are truly grateful for all Bishop Doyle’s support and for that of Fr. Patrick Hutton and of course all the priests of the Fraternity of St. Peter. Watch this space; another very exciting development will be announced shortly! 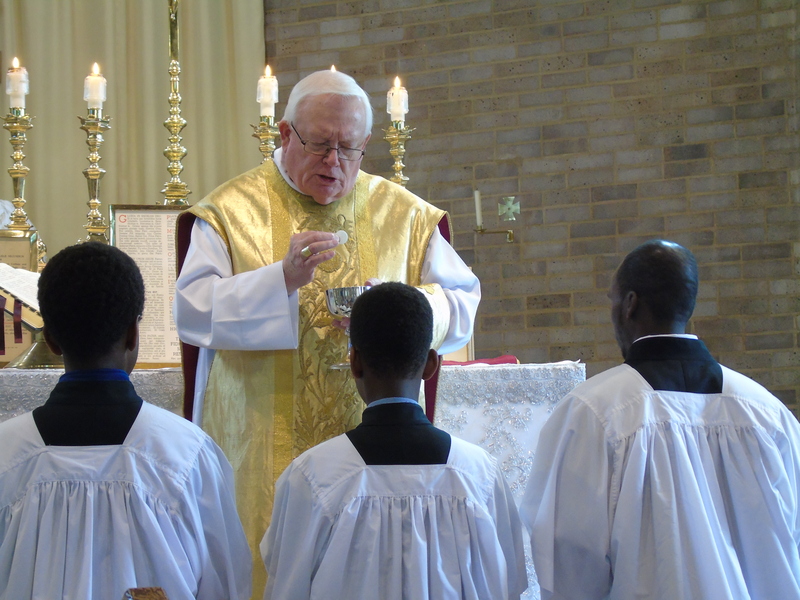 During his pastoral visit to Christ the King, Bedford, on the weekend of 12 – 13 May, Bishop Peter Doyle of Northampton was called upon to go the extra mile. 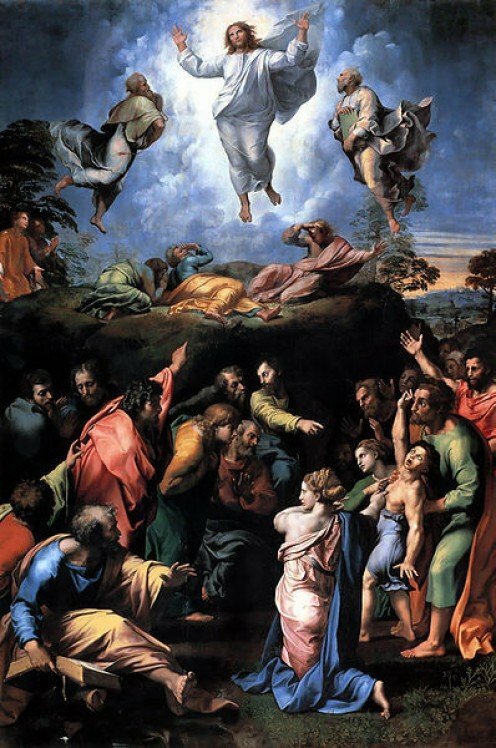 He was due to preach at the Latin Mass, but at the last minute, due to unforeseen circumstances, he not only gave the homily, but celebrated the Mass as well. He told us afterwards that it was the first time he had celebrated in the Extraordinary Form. Bishop Doyle’s Latin proved to be excellent, and with guidance from Fr Goddard, all went smoothly and the Holy Sacrifice of the Mass was duly and properly offered. We are very grateful to both Bishop Doyle and Fr Goddard for adapting so readily to the situation and so enabling the Mass to take place. Today is a Holyday of Obligation! Mass tonight will be at 7:30.
heah ond halig, ofer heofona þrym. We have a fantastic evening planned for Friday 6 July under the auspices of the Social Committee at Christ the King. 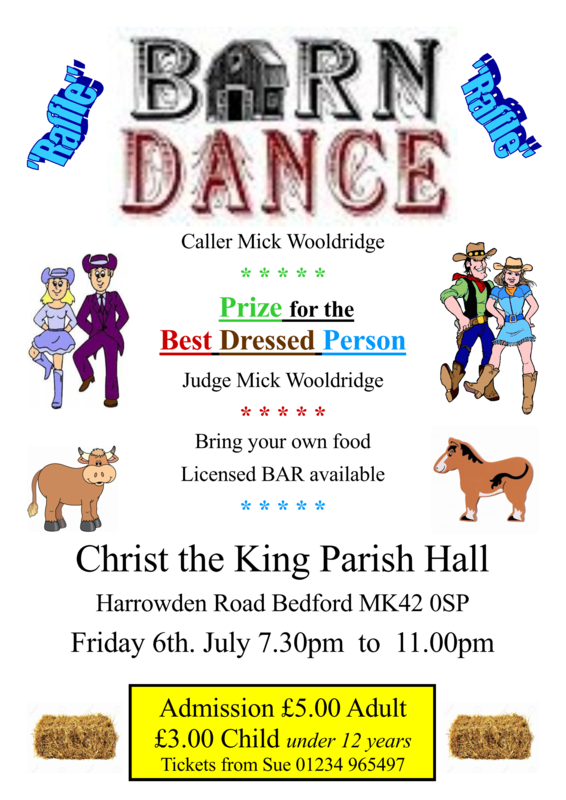 Mick Wooldridge, the husband of one of our congregation, is a barn dance caller and has very kindly offered his services free of charge. Mick also plays the saxophone and will be playing between dances while we catch our breath! Bring your own food, but there will be a bar, raffle and barn dance costume fancy dress competition. All for a very reasonable £5 for adults and £3 for children. After expenses, the proceeds will be divided equally between the parish and the FSSP. Mary Wooldridge has tickets available in the hall on Sunday mornings. The parish contact is Sue Anstead, 01234 965497. 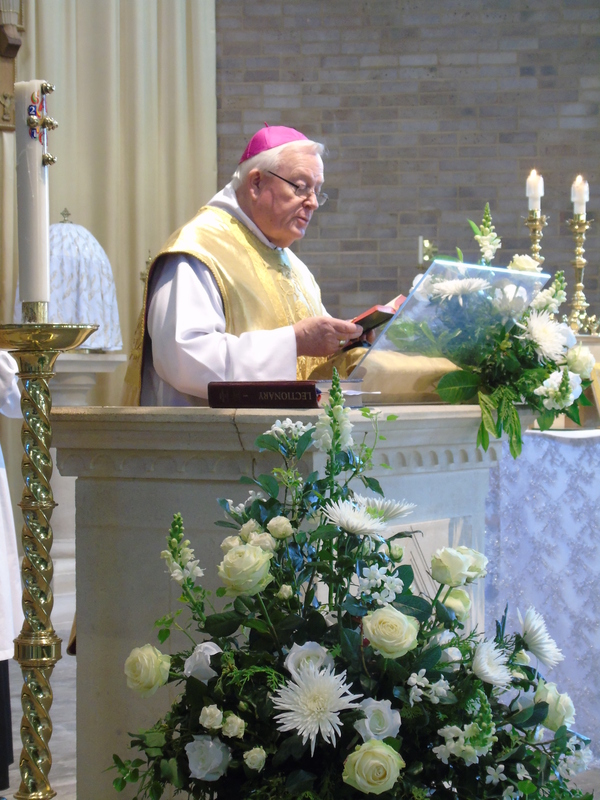 One of our parishioners, Eric Caudle, took some wonderful photos of the Mass last Sunday. Like what you see? It happens every week, and it’s even better in person!